Episode 1 - I'm excited to announce that the first episode of my podcast about the Mahabharata is now available. There are more episodes to come shortly. This one is just a brief introduction to let you know what this project is all about. There are a lot of different interpretations of the Mahabharata out there, and they are all so different from each other, because the original writing is often so obtuse that it is very hard to get past. But buried beneath all the archaic language and reptition is a really fascinating story. My problem with the abridgements and adaptations out there is that they all without exception change the facts of the story, and skip a lot of the detail that I think gives one a real feeling for the authors' original intent. I will try to remedy this as best I can in this podcast. Finally, I really appreciate all those great podcasts out there that help me to while away the boring moments of my life, and I hope this offering is a way of giving back. I hope you enjoy it! I enjoyed the worm in an apple story! Lots of humor in this epic. I also like the echo chamber sound effect for the pronouncement. This is great listening. I'm a bookbinding student of Connie's (from your gamelan) and a fellow lover of the Mahabharata. She hipped me to your podcast & I am totally looking forward to it. I too, think the abridgements miss a lot of the truly special aspects of the tale. I can't stop reading it (Ganguli, Dutt, now Lal translations). Send me an email if you want to converse offline - I'd be into hearing which translations you've read, etc. But rest assured, once I get caught up in your posts you'll be seeing me in the comments. Hello root; All I've got to go by is your posting, so maybe you'll check back... My procedure lately has been to read van Buitenen's translation of the critical edition, and then use Ganguli while I am composing. Ganguli's version seems to be based on the same source as the Hindi TV series and other mass-cultural sources. So far, what is in Ganguli is also in the critical edition, but there are details in Ganguli that were not in the critical edition. These differences might be later additions (I don't know how they can tell), but they play an important part in what modern Indians know about the Mahabharata, so I feel they should be included. An example is the disrobing of Draupadi. The critical edition does not have Krishna in that scene. The miracle is left unexplained, while Ganguli follows the popular version, in which Draupadi calls on Krishna who intervenes with this miracle. Good job keep doing the good work. God bless you for the good work you have done. Take 'Still/Captured' pictures of scenes from BR Chopra's Mahabharata and assemble them in order with subtitles and thus create a graphic-epic book. Capturing the images from the DVDs is the easy task ---get the narrative text to aliagn with each Picture is more time consuming. Thank you very much. I really enjoy listening to the cast. I am a 50 yr old Indian engineer working in Yemen. I came across your wonderful podcasts - I listen to them on my way to office and back which is a short 20 minute drive. Your narration is so good that I look forward to traffic jams !!! Hi Lawrence. Years ago, I took a South Asian epics course that covered the Mahabharata and the Ramayana. It was taught by Robert Goldman and it was possibly my favorite college course ever. I've been listening to your podcasts and it's really taking me back. Keep up the good work. Also, do you know if there is any way to access episodes 1-3? Both Zune and iTunes start at ep 4. As for the podcast feed, I'm working on it. It is a technical issue with the feedburner people, which is a free service so I can't complain too much. Great undertaking. I like your approach of going by the genealogy and time line as opposed to the original structure of Mahabharata (a frametale). However, it would still be in the interest of the listener to mention the "PARVA" that the story comes from. Thanks for the feedback. I'm afraid it would be a late change for me to start mentioning the Parva now-- I'm already deep into the Book of the Forest. There are two types of Parvas in the Mahabharat; the Books, of which there are 18, and then (I guess you'd call) Chapters, of which there is a total of 100. I have been very clear as to the book, but no so much with the Chapters. At times the structure of the Chapters is confusing, especially in the Forest Book, because they get interrupted by sub-stories. As for following the "original structure", I would say that I am. If you miss the episode of Ganesha & Vyasa, that would be because it isn't in the Pune Critical edition of the Mahabharata. I am in fact following the story in precisely the order it is presented in the Critical Edition. The only deviation I have made (so far) is when I refer to the Ganguli translation, or when I made a foray into the Bhagavata Purana for more info on Krishna. Aside from that, all I am doing is taking the original story and trying to make a modern narration out of it. I don't leave anything significant out, and if I suspect it might be significant to someone, I at least mention it. So far that has only consisted of leaving out some stories that are either so convoluted that I can't make sense of them, or too fragmented to be of any interest. There are a lot of those near the beginning, but once the story gets into the generation of the Pandavas, it is pretty much smooth sailing after that! I just started listening to this podcast and I gotta say I'm loving it. It takes me back to the years when my grandmother used to tell me these stories. I didn't know any of the background; this podcast gives me such a deeper appreciation of the stories and of my grandmother. Thanks for re-awakening a part of me that I lived without for so long. Looking forward to listening to the rest (I'm only on episode 8 but I keep listening to the episodes over and over so I can remember names). Hello! I've just listened, for the first time, to an audio version of the Gita and it inspired me to seek out the Mahabharata. I'm so grateful you have undertaken this production. I tried to subscribe via email but FeedBurner rebuffed me: "The feed does not have subscriptions by email enabled." No worries, for me. I've bookmarked the page, I was mainly subscribing so your statistics would reflect more interested listeners. George: I just tried using the "Follow by Email" function up in the right-hand corner of this page, and it worked for me. It sent me a verification email and I received it. Did you try using that? How far did you get? this is a great undertaking. thank you! would that not be Vyasa, who in fact is the Pandavas' (Arjun etc.) grandfather? Yeah. You're right. I was thinking in terms of his being Satyavati's son, rather than the Pandavas' grandfather, but I still overshot. In dynastic terms, Dhrtarastra & Pandu were honorary sons of Vicitravirya, so Vyasa was both the Pandavas' grand-uncle as well as their grandfather! Anyway, I just edited the audio and removed the word "great", and now it is accurate again. It's a clean edit, too! If others report a problem, it would be worth investigating whether or not JS is disabled. For the record, I was using 'NotScripts' on Chromium 14. Maybe you could link your sources here and talk about how you made decisions for which source to use. The blog could be your footnotes to the podcast. BTW, how do you set up podcasts on comcast.net -- is that your own server space? 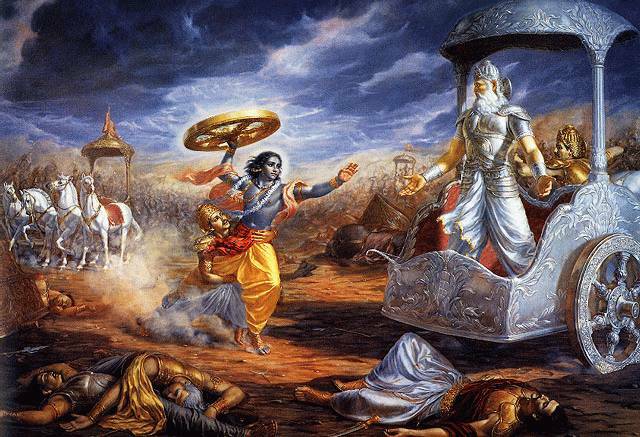 When it comes to English resources, the Mahabharata is quite limited. There is only one full translation in print, from the 19th century, by Kisari Mohan Ganguli. It is public domain, so this version is available in any format (http://www.sacred-texts.com/hin/maha/). There are partial translations in print, beginning with J.A.B. Van Buitenen, and the Shaw Sanskrit Library has selected Parvas. And that is about it! I discuss sources in the podcast itself. I am working on putting together a web page with references and pointers to all the episodes-- some housekeeping that needed to wait until I finished producing all the episodes! As for comcast.net, they are my ISP, and they gave me some public space online, so I stuck the audio files there. Since then, I've also uploaded the entire podcast to the Internet Archive (archive.org). I plan on pointing the links in this blog to that location, so even if I quit paying my ISP bills, the podcast will live on! Lots to do still! planning to re listen from ep 1. This was so good. Wonder if the author is working in any other projects like this? I know I am a bit late to the party, but I am just about to conclude the podcast and its been one of the best I've heard. Being an Indian, it was a good source of learning one of my epic. Thank you for the information, I am sure collecting it all wouldn't have been easy!